To promote the 1948 Cary Grant and Myrna Loy movie “Mr. 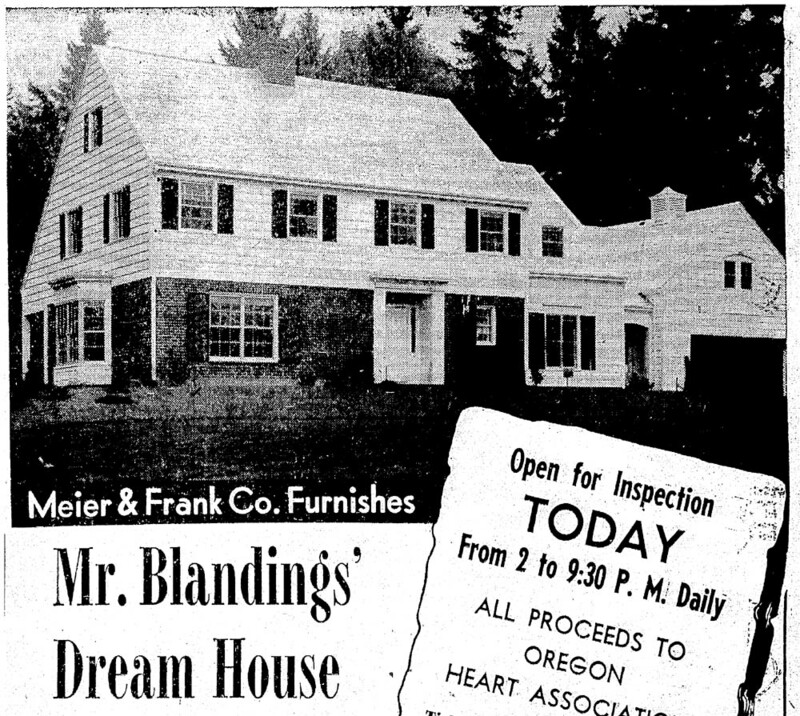 Blandings Builds His Dream House,” the studio built “dream houses” in various cities around the country. The Portland-area house was built in the Cedar Hills area of Beaverton. As well as a promotional device, it was built using the latest post-war materials and technology but with a traditional design and decor. It’s still a lovely estate on the northwest corner of SW Walker Road and Mayfield Avenue. 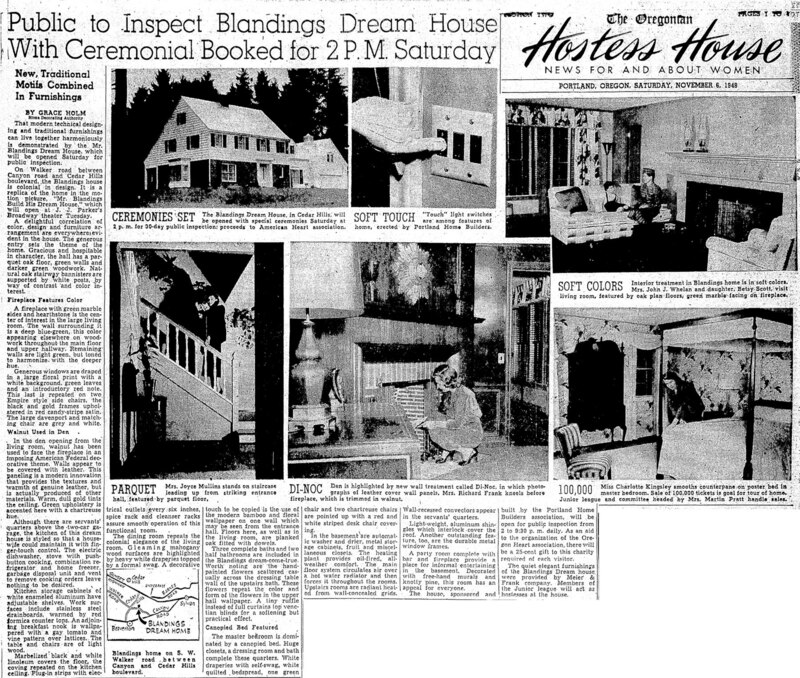 Read the feature article in The Oregonian, November 6, 1948. How cool is this! Click here. You’ll be glad you’ve clicked on the link because you’ll find out how to get a chance to see “Mr Blandings Builds His Dream House” at the Hollywood Theatre. Too bad we don’t know what its address is. 2715 SW Mayfield Ave., Portland. If it really was Mr. Blandings “dream house” Randolph Scott would live in the basement….. I was there in 48. Thanks. Dave, you should have been a high school librarian like I used to be, then you could have found the house by using the names of the cross streets and Beaverton Oregon at Google Maps and found it in about two minutes. Just something I got good at in dealing with those students who always knew more about computers and searching than I did, those great ones willing to teach an ol’ lady a thing or two! Checkout http://www.refitgoesHollywood.com and join us for a benefit showing of the original movie at the Hollywood Theatre Feb. 23rd! A great time and all money goes to benefit ReFIT, A non-profit that builds wheelchair ramps and bathroom modification for low income disabled members of our community. My sister lived here for a bout 10 years. She moved about 5 years ago (I think). Ironically, she worked for Meier and Frank until they were sold to Macy’s and closed their executive offices in the downtown store. Mike, saw an article in the St Louis paper…your sister commented on the house!